Nutrashield provides an effective, long-lasting moisture barrier against incontinent episodes while relieving dryness, abrasion or denuded skin. It protects the skin with an advanced silicone system. This combination helps Nutrashield last after repeated washings. 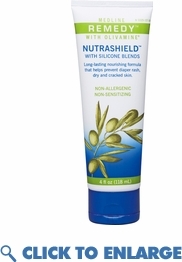 Helping to prevent skin moisture from evaporating is an important function of Nutrashield. Nutrashield protects against TEWL by sealing in the moisture and creating a more favorable environment for healthy skin. Continues to offer protection even after multiple washings. Ideal for patients with very dry skin, such as those associated with venous leg ulcers, and can be used under compression wraps. Unlike other moisturizers, Remedy™ Nutrashield won't interfere with the antimicrobial properties of CHG (Chlorhexidine Gluconate). It can be used before or after washing with CHG products. Additionally, it does not interfere/degrade latex gloves. Active ingredients include dimethicone (1%) and enhanced ingredients include Olivamine®, organic aloe vera and natural oils. Olivamine® is a blend of antioxidants, amino acids, vitamins and methylsulfonylmethane (MSM). These ingredients are all known to play a vital role in basic cellular construction and protection. Olivamine® contains antioxidants like hydroxytyrosol, the most potent antioxidant known today (derived from olives). It also contains amino acids like L-proline, L-cysteine and glycine - three of the main building blocks of collagen. These components are also treated with photoacoustic resonance to help minimize the tendency for inflammation, and to ensure they can be rapidly accepted by the skin.